Fire up your children’s imagination and creativity big time with Child Table & Chairs Sets from Brandenberry. 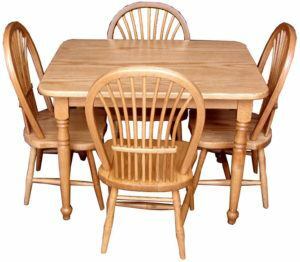 Amish craftsmen build all our Child Table & Chairs Sets from solid hardwood. So they’re more sturdy and durable than the bargain sets you’ll find at kids’ stores and other places. 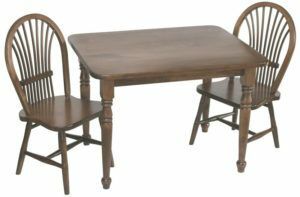 Solid Brown Maple Child’s Table Set with Two Sheaf Chairs that you may customize to meet your child’s needs. A Small Royal Mission Table set crafted for children made of solid Oak wood. 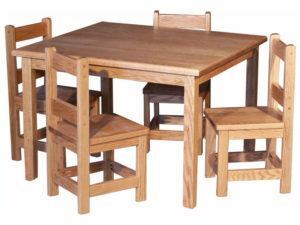 A solid hardwood children’s table set with four chairs and featuring Royal Mission style design. 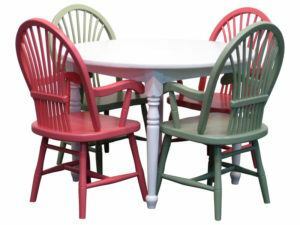 A classics child’s table set with four square chairs. A solid hardwood table featuring Oak wood and two square chairs. Give your children a dining table and chairs of their own. This solid wood table is perfect for kids and painted in three different colors making dinner and playtime extra fun. You’ve found a source of child table and chairs sets that are designed to be outgrown by kids and passed on to the next generations. Who but Brandenberry Amish Furniture can make such a claim? Solid construction. Skilled Amish cabinetmakers handcraft each piece. And they use the finest hardwoods. Plus, they apply the same skills and precision as they do when crafting furniture for grown-ups. So these miniature tables and chairs are grown up in toughness and longevity. This means they’ll take the rough treatment little munchkins like to mete out. Also, with proper care, the sets serve generations of little people. Variety of styles. As you can see from the collection above, we offer many different styles to choose from. This means you can order a set like the Royal Mission, and match up the kid’s set with the grown-up furniture. Cool, huh? Full customization. 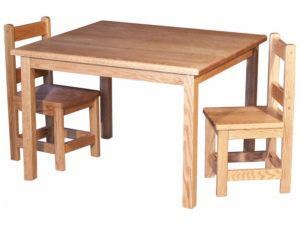 You can order a child table & chairs set as shown. Or you can tell us your customization ideas. And we will create the set just the way you like it. For example, you can choose the wood specie, plus the stain or paint. Or, you may go for a smaller table with two chairs or a slightly larger table with four chairs. And if you only need chairs – or just a table – we can fill those needs as well. Full engagement. A child’s table and chairs set stimulate kids’ creativity and imagination like few other playroom items do. Kids spend hours sitting behind their miniature table. Playing board games, reading, playing house or doing homework. So you can consider the table a kids craft table or a kids activity table. What’s more, kids use similar tables and chairs at school. So the ones from Brandenberry at your home will put your kids and their playmates in familiar territory. Visit us in Shipshewana, Indiana, to see the kids table and chair sets for yourself. You’ll notice that they’re not only durable enough to handle years of play, but also beautifully crafted as well.